The Pioneer Woman Boarding House is an eight-room “cowboy luxury” hotel in Pawhuska, Oklahoma. Your stay will be unforgettable! Ree and Ladd Drummond look forward to showing you what Osage County hospitality is all about. Come stay for a night or two; we promise you won’t ever want to leave! 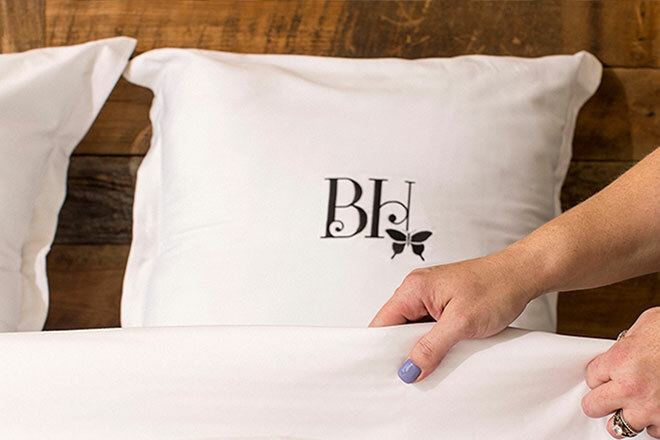 From personalized morning coffee delivery to treats on your pillow, we’ll make sure you feel right at home. Food is at the heart of The Pioneer Woman, and we’ll offer you plenty of delicious options while you’re here! White wainscoting and charcoal walls set off a gallery of Drummond Ranch photos snapped by Ree herself. Black trim, mirrored furniture, sparkling light fixtures, and pops of saturated green wrapped in old school elegance. Lovely, gorgeous, beautiful! Step into a soft, soothing space with soft blues and subtle wood finishes. Distinctly decadent. Burgundy velvet furniture combines with sparkly chandeliers and glossy black paneled walls. A vintage mural is highlighted by industrial metal and simple finishes in this fabulously roomy suite. Leather furniture, a casual mix of pillows, soft cement-colored walls, and a simple, rustic bathroom exude hints of Drummond Ranch. Small but sensational, with a rustic barnwood wall, bursts of turquoise, and a cozy, comfy vibe. Elegant wood paneling, a stunning slate bathroom, and hints of horses everywhere make this handsome room a dream.